Dartmouth is the most rewarding place I have ever been — and yet, also the strangest. I have met some of most brilliant minds and some of those same minds have been just as ignorant as they are intelligent. I do not mean to insult them, and I am not assigning blame. What I am getting at is that because the Ivy League has gone need-blind, there is now a significant mixing of class and culture on these campuses. This is by no means a bad development, but I think it is time that we explore some perspective on the experience of a poor student at Dartmouth. Arriving here from community college in 2012, I was overwhelmed at first by the flair and festivity of the Dartmouth Outing Club’s First-Year Trips. Orientation consisted of speeding through the various services and resources of the College while I was barely able to absorb most of the information. Suddenly, classes began, and I quickly realized that I was drowning in the deep end. My high school education was irrelevant in the scheme of prestigious universities, and community college was preparing me for the University of Massachusetts — not Dartmouth College — and I soon began to question if I was adequate enough to even be a student here. Looking back on this time, I realized that there was not just an academic difference, but a social one as well — particularly when comparing rich students lives’ to those of poorer students. Speaking from personal experience, my old streets of Everett, Massachusetts, had probably never seen a person walking in salmon shorts and Sperrys boat shoes. From multi-ethnic urban neighborhoods where most people disliked or mistrusted one another, I entered a tiny rural community dominated by white upper-class individuals. There was seemingly no such thing as a teen pregnancy, most people had never gone to a funeral of anyone besides a grandparent and, aside from the hockey team, most students have never even been in a fight. I did not understand students’ styles of dress, speech or their experiences. People would ask if I had rowed or played squash before Dartmouth, and I would answer, “Poor people don’t do that.” My first year at Dartmouth was marked by a hyper-awareness of my low socioeconomic status. That hyper-awareness of poorness is compounded by the things that your peers do that you cannot. Sometimes there is a feeling of being left out, like when friends go on exotic vacations during interim periods or when you need to refrain from spending money while studying abroad. Recently, I was accepted into the English department’s foreign study program for this fall in Dublin. This will be the first time I will leave the United States since I deployed to Iraq in 2006. When talking with other students about the full week off we have in October, they mention visiting London, Paris, Barcelona, Florence and various other European cities. They encourage me to do the same — unless the English department is going to give me a couple grand to have a mini tour of Europe, however, I think that the farthest I will be exploring will be the Scottish Highlands or Belfast. When I tell the other students this, they often look slightly confused, almost as though it is a natural reflex to indulge as much of a foreign adventure as possible. The truth is that while I am minding my wallet, I will be also watching many of my peers go off to do so many of the things I wish I could. Money is a primary woe of many low-income students at the College. It is the immediate consideration for anything we want to do — it has to be. Whether it is a non-profit program in the U.S. or another country, an unpaid internship in a city that is not home or even an extra term, we need to stop and determine if we can actually afford it. Internships are probably the worst of it. Unlike many other colleges, there is almost an expectation among peers to land an elite internship. Unless you are in finance or consulting, chances are you are not getting paid over your leave term. Yes, there are all sorts of funding opportunities that Dartmouth provides, but none of them are guaranteed. Applying for internships while taking classes is enough of a stressor, but worrying about whether or not we will actually get a grant to go work and survive in a new city is another major challenge for many students. Personally, I think it is appalling that many of these internships are unpaid. Students are pressured into finding money to live on to put a few lines on their resume and have few minutes of conversation with an employer. Bottom line, if for some reason we do not get the funding from the school, students of lower income are not in a position to get that sweet internship. There are dozens of other issues I could discuss related to being a low-income student. Further, I think that since it is spring and many students are really beginning to think about their futures, it is appropriate to point out the challenges. 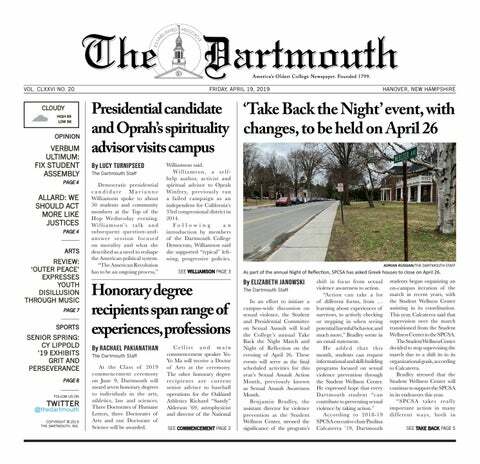 Administrators need to increase financial aid for all parts of the Dartmouth experience, and students need to be more cognizant of their peers’ backgrounds. We are supposed to have the greatest opportunity of our lives in coming here, but we still have some work to do in making it better for everyone — not just the students coming in from a place like Phillips Exeter Academy.